What Will Become of Spider-Man Post-Secret Wars? So Spider-Man has gone through a lot of trouble lately: he switched bodies with Doctor Octopus and then died, then he when he returned back to life (long story) he was almost immediately embroiled in a multiversal "Great Hunt." And soon, Secret Wars will arrive and the Marvel universe itself will cease to exist. I would love Miles Morales as the main, but with an older Peter Parker as the mentor, a la Batman. I'm assuming they meant Batman Beyond, since that's the one where Terry McGinnis is the new Batman and older Bruce Wayne is his mentor. It's a good idea, but if we tweak it, we can make it better: now a married father, Peter Parker hands off Spider-Man to Miles Morales. He helps Miles with his guidance and technology from Parker Industries. This isn't just random speculation, either. From what I can see, this might actually be the direction Marvel may go. 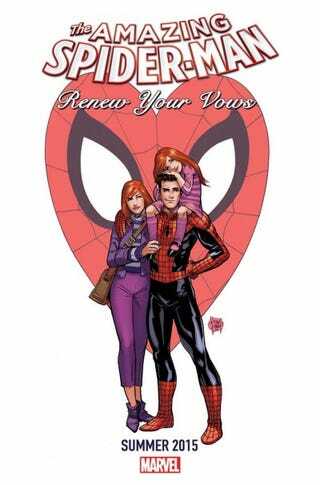 For one thing, there's the "Renew Your Vows" preview image for the Amazing Spider-Man Secret Wars world showing a Peter Parker married to Mary Jane and with a young daughter. And there's the continuing storyline of Parker Industries in Amazing Spider-Man — a company that Peter hasn't been giving his full attention to and which has suffered as a result. This would also fit in with the whole "Marvel and Ultimate universe will be smushed together" thing. Miles moves over to the main Marvel 'verse (along with his supporting cast and probably some Ultimates) and takes over as Spider-Man. Basically, this is a win-win. A lot of fans love Miles and a lot of fans hate "One More Day," which would have to be retconned out of existence (oh the delicious irony). I have no idea if they will go in this direction, but I sure hope so.